The Japanese are not especially known for their love of sweets, and indeed Japanese children are more commonly seen snacking on an onigiri than they are a chocolate bar. That said, this wonderful people are certainly known for their attention to detail and love of all things cute. With this in mind, Into Japan’s Hannah braced a boiling, 38C afternoon in Tokyo to find out more about amezaiku, the latest addition to Into Japan’s Weird and Wonderful Japan selection. Asakusa Amezaiku Ameshin is a small atelier in Asakusa, a vibrant area of Tokyo soaked with tradition and dripping in culture. In short, it’s the ideal place for such a workshop. Summer in Japan can be brutally hot and humid, and on the day I visited, Tokyo certainly did not disappoint. The city was ablaze with sunshine, and a 90%+ humidity ranking to match. I was relieved to enter the workshop, and it’s cool, air-conditioned, wooden interior was very welcome. Inside were four work-benches, with each accommodating a maximum of 6 guests. We were each shown to our seats, and as a foreigner I was given a seat close to the demonstrator to make sure I could fully understand the process. The craftsmen here only speak Japanese, so we recommend a guide accompanies you to act as interpreter. So what exactly is Amezaiku? In short, it’s a traditional Japanese craft involving moulding molten candy into amazing, lollipop-like creations. The candy is softened by heating to around 90 degrees C and is then carefully shaped by hand using special scissors. All kinds of models – pandas, goldfish and birds to name but a few – are created by cutting, pulling, and bending candy which is attached to the top of a stick-handle, like a lollipop (the creations are edible). The tricky part is that an Amezaiku creation has to be finished within just a few minutes of removing the candy from the pot. The candy is softened when heated, and hardens when it cools. The technique is thought to have originated in the 8th century. During the Edo period (17th to 19th centuries), craftsmen showed performed the art of Amezaiku on the streets as entertainment and to sell to the people. 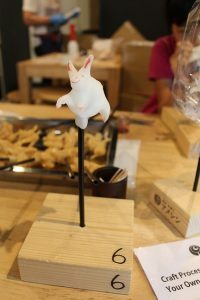 During our workshop session, we were making a rabbit. The craftsmen had placed a finished product in the centre of each table as inspiration for us all, and we were all very keen to begin working on our own beautiful, elegant creations. Watching a professional demonstrate the process to us, it soon emerged that we had quite the challenge ahead of us though! The craftsmen were able to seamlessly replicate this rabbit in just three minutes, the time it takes for the candy to harden. Ears, tale, limbs angled to look as though the rabbit was about to hop along at any moment, it was incredible! Next it was out turn. One-by-one we were given a ball of beige candy to practice on and we watched each other excitedly as we each had a chance to practice. Thankfully, we had a simple instruction sheet detailing the process in front of us. This was really helpful in reminding us of the order in which we needed to create each of the rabbit’s features: starting with the head, ears, face, front limbs, paws, neck, hind legs and finally tale, it was an intricate process. We were given three practice goes, and in between each practice the professional craftsmen would demonstrate again to give us additional hints and tips. The practising phase proved very entertaining with many of us creating animals which more closely resembled pigs or elephants! We quickly learnt, as we inadvertently cut off limbs and tails, that whether you were pleased with your creation or not, there was a good reason why the craftsmen told us that once the candy had cooled, we needed to leave it alone and resist the urge to make additional tweaks! It was also important to get the pressure right during the moulding phase: too much pressure and your rabbit would suddenly end up with a very big head, or very short legs! After a final practice, it was time to move on to the real thing. This time we were each given white candy to use. We had all improved significantly since the first attempt, but mastering Amezaiku certainly takes more than just a couple of hours! Having moulded our rabbits, we were then given a tiny bottle of red dye and a cocktail stick to enable us to add features and little details. Hannah’s finished product – the best of her four attempts! The craftsmen then took our rabbits and wrapped them in an air-filled cellophane bag. Although for the majority of those in the workshop, we hadn’t managed to exactly recreate the masterpiece that we were shown at the beginning of the afternoon, we were all very pleased with what we had achieved, and it was a great experience! Amezaiku is just one of the brilliantly quirky things which makes Japan, and Tokyo, so unique. Experience the weird and wonderful for yourself, and include an Amezaiku experience in your trip. Recommended for: Those who are creative and interested in Japanese craft-culture. We’d recommend the activity for children 8+, as long as they are accompanied by an adult.